These old vines were planted by my grand-father Zind in the Herrenweg area. It is a very important vineyard because he chose an exceptional massal selection. 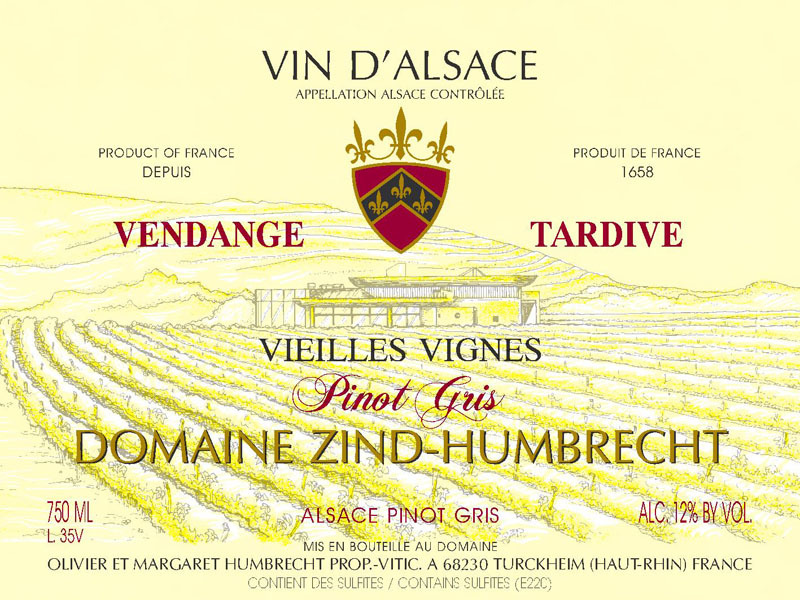 Most modern Pinot Gris clones are very fertile and will grow at least three large clusters per shoot, making it difficult to control yields. Just like Pinot noir, its cousin, Pinot Gris’s quality will drop quickly as yields increase and it will also become more prone to rot. Today, we select these vines for our current young Pinot Gris plantations. In 2010, the crop was so small that the richness soared very rapidly in September. When noble started to develop, it was clear that we had to leave these grapes go all the way up to Vendange Tardive ripeness. The fermentation was quite fast and the wine found its ideal balance with a large amount of residual sugar. 3/2012: the nose shows clear evidence of noble rot: unctuous white fruits, some exotic flavours but mostly bee wax and honey dominate. The palate feels extremely rich and round at first, but the acidity quickly takes over and brings a wonderful firm finish. It is always a wonder to see how natural fermentations can stop at the exact ideal sugar/alcohol balance.